We're continuing our look into the typical daily/weekly/monthly life of Team Evotri. So far, we've had Sarah followed by Sara and then Michelle. Read along with us as JP fills us in on his emotional adventures in the week before a season kick-off race. Day 1- Oh Dear Lord. I found out that my bike frame is non-functional. My sweet Seduza's dropout had cracked straight through. I rushed it to the ER only to be told that it was a terminal issue and required carbon repair. I went home, despondent, and put it on the trainer as it would have been a liability on the roads. I spun for 2 hours in silence. 1 hour aerobic, 1 hour speed. 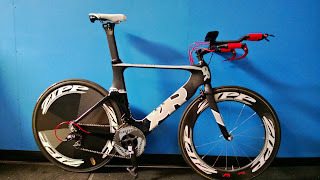 Day 2- I got out in the morning and nailed a moderate paced track session, thinking about my bike the whole time. Depression was the name of the game. I had a race on the weekend and needed a steed. I had to solve the issue and it would take some creativity as I had a strict budget and no time to waste. 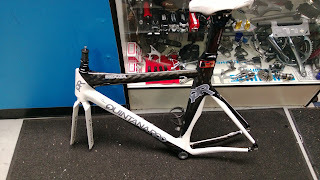 Fortunately, I had a CD0.1 frame that I was waiting to build so it's time had come. It was about to be called up to the Majors. I sold my SRAM crankset and bought a SRAM Red BB30 version on sale which ended up clearing up some cash. Then I ordered some levers and I decided to gut the seduza and use the parts. I hit the pool after work for a 2500 swim. Again, a moderate effort just getting the work done. Chop wood. Carry water. Day 3- Day off as I was feeling fried. My volume has been high this year and I am still figuring out how best to handle it. With a race on the weekend, I like to have two full days off in the week before. I find it helps me get that "pop" feeling of freshness on the day. Day 4- 6 mile run with some hard strides. I had no idea what the weekend would hold as I hadn't touched on race pace all year except a bit on the bike. The first race of the year is always a crap shoot. It's even more of a crap shoot when you are riding a new bike for the first time. Legs felt good overall. Aerobic system was still lethargic but that was kind of expected. Patience is the key in race week. Day 6- I went up to see Phil and he made quick work of the CD0.1 build. The nicest touch in my mind were the wicked red highlights in the cockpit and the red cable housing. It just looks FLASH! With Team Evotri, style is what it's all about. 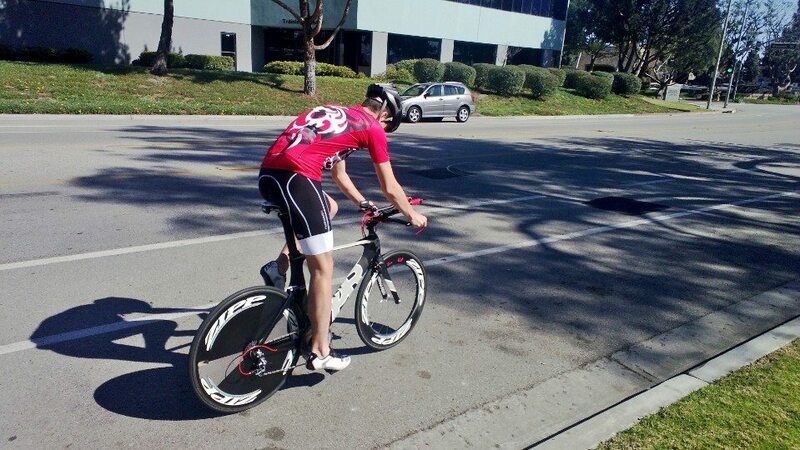 After some trialing and tweaking, we left Hypercat and headed for the bike course of the Camarillo duathlon. Even though I was really familiar with the area, I wanted to make sure I would know the turns (oooooooh...foreshadowing). 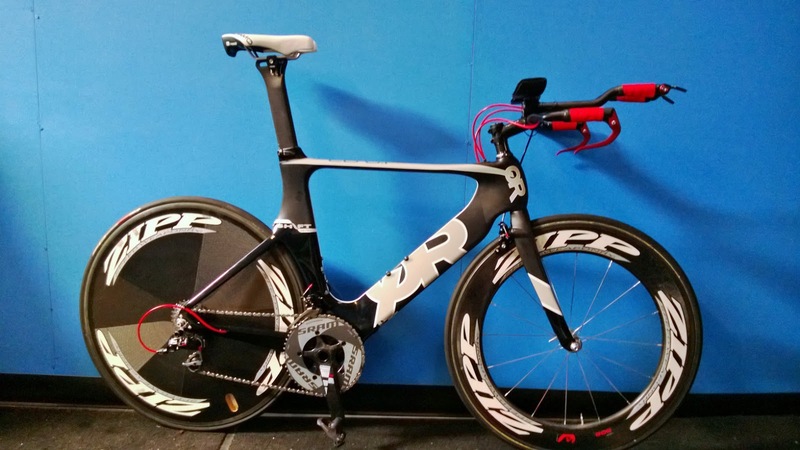 I zipped around the course and the bike felt snappy and stable despite some serious wind. It squirted along the flats like a bar of soap and felt rock solid. Love it! Ready to race! Day 7- Nervous for the first time, I got in the car with Caitlin riding shotty. 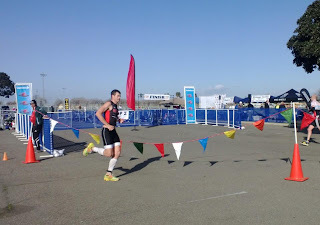 We headed to the check-in and I went about my twitchy checking and double checking pre-race routine. My type A-ness (say that fast) was showing big time. After a quick warm up, I hit the start line. I did a quick prayer for safety right before the BANG! I was off and in the lead for the first 1/4 mile. Two guys moved through and I kept in touch, settling into my rhythm. I checked my GPS and I was well sub 6 so I relaxed knowing it was a good place to be. The first lap was done and I was feeling... comfortable??! Comfort is a rare feeling at 5:47 pace for me. I rolled around the next lap and into T1 sitting in third with 1st about 20s up and 2nd about 4s up. 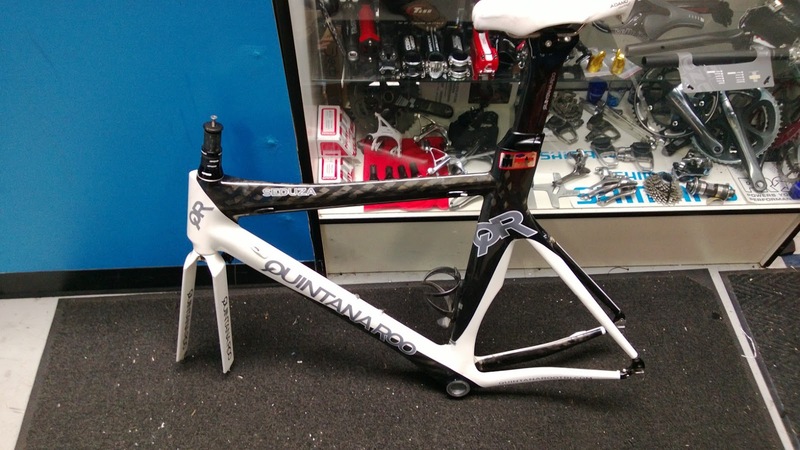 I tore through transition and onto the new Quintana Roo. This was where I would move. I made short work of the 2nd place and set off like a death train from hell after 1st place. I was locked in and making slow chips out of his advantage. Complete tunnel vision. I had his lead down to 5 seconds as we dived into a turn... I noticed the street sign as we leaned into the turn. OH CRAP! We were off course. Un-freaking-believable! I yelled to the leader but the head wind drowned me out. I spun around and headed back to the course cursing at my bumble. All told I added on 5.5 miles but rode well. 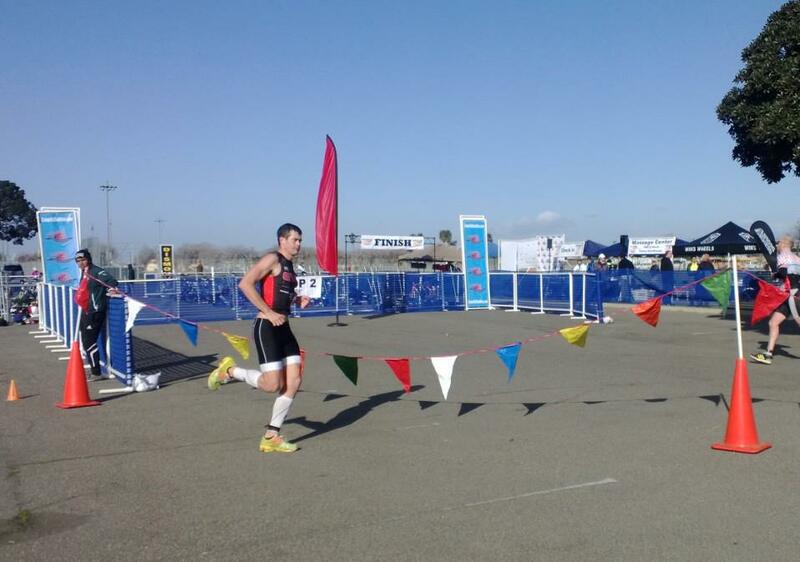 Despite a solid wind, I held a 24.2 mph average into T2 and I was out onto the run. I shot off, running with a bit of agitation at my stupidity. 1st mile was 5:48! I was stunned and now was jazzed to keep the turnover high. Second mile came in at 5:45. Finishing it off with a 5:46. And Boom goes the dynamite!